Let’s face it. It seems that converting our friends and families to become believers in Christ has gotten tougher and tougher. As ambassadors of Jesus, we are finding that this society we live in doesn’t seem to be very attracted to what we are trying to sell them. If we’re ever going to bring change, then we need to start by being honest…we are doing something wrong! The truth is that as Christians, we don’t even truly understand what we are supposed to be selling to the world. We want them to know that Jesus will keep them out of Hell. We are quick to share with them that believing in Jesus will help them to stop sinning. Are these reasons valid? Of course! But in this, we often forget our true purpose as ambassadors for Christ…to let them know that God loves them and has freed them from the demand of the law that they be perfect! There is only one is perfect – that’s Jesus Christ! (2 Corinthians 5:21). As long as we live in this flesh, we will never be perfect (I John 1:8). The law requires that we be absolutely perfect (James 2:10). So, where does that leave us? Left to ourselves, in big trouble! Jesus died and was resurrected, to take away our sins and give us the FREE GIFT of righteousness and right standing before God (Romans 5:17, I Peter 2:14). We are made right with God by our faith in Jesus, not by our obeying the law or striving to be perfect (Galatians 2:16). Grace is all about God’s unmerited, undeserved favor that He has bestowed upon us, showering us with blessings and good things, even though we don’t deserve it. 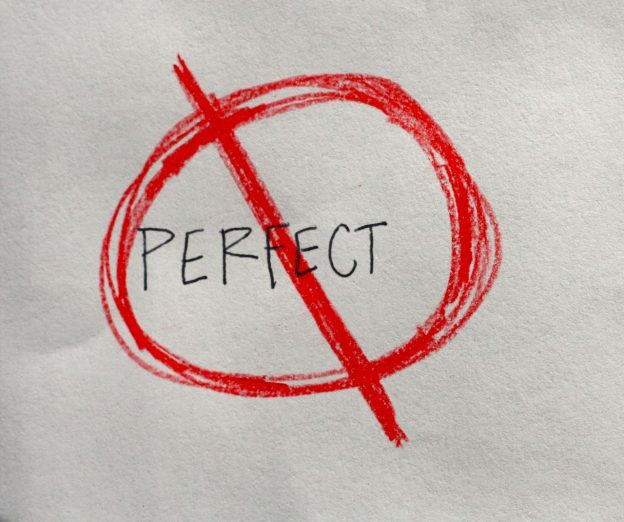 Striving to be perfect is like banging your head against a wall. Not only will you never reach perfection, but you put yourself at the risk of rejecting the finished work that Jesus did for you on the cross! We have got to get off of this kick of striving to being perfect all the time, and demanding that others “get their acts together” in order to be close to God. If I hear from one more pastor or church attendee, “We’ve got to obey God!…”, I’m going to scream! Telling this to a person who is struggling in life simply heaps more shame and condemnation on them, which often drives them further away from God. “A new commandment I give to you, that you love one another; as I have loved you, that you also love one another. By this all will know that you are My disciples, if you have love for one another” (John 13:34,35, NKJV). “And I am certain that God, who began the good work within you, will continue His work until it is finally finished on the day when Christ Jesus returns” (Philippians 1:6, NLT). This entry was posted in Coaching on July 23, 2016 by kHHz9uqIE4UG.